The IBM® Distributed Virtual Switch 5000V (DVS 5000V) is a software-based network switching solution that is designed for use with the virtualized network resources in a VMware enhanced data center. It works with VMware vSphere and ESXi 5.0 and beyond to provide an IBM Networking OS management plane and advanced Layer 2 features in the control and data planes. It provides a large-scale, secure, and dynamic integrated virtual and physical environment for efficient virtual machine (VM) networking that is aware of server virtualization events, such as VMotion and Distributed Resource Scheduler (DRS). The DVS 5000V interoperates with any 802.1Qbg compliant physical switch to enable switching of local VM traffic in the hypervisor or in the upstream physical switch. Network administrators who are familiar with IBM System Networking switches can manage the DVS 5000V just like IBM physical switches by using advanced networking, troubleshooting, and management features to make the virtual switch more visible and easier to manage. 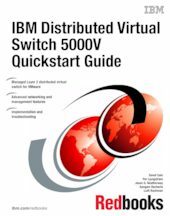 This IBM Redbooks® publication helps the network and system administrator install, tailor, and quickly configure the IBM Distributed Virtual Switch 5000V (DVS 5000V) for a new or existing virtualization computing environment. It provides several practical applications of the numerous features of the DVS 5000V, including a step-by-step guide to deploying, configuring, maintaining, and troubleshooting the device. Administrators who are already familiar with the CLI interface of IBM System Networking switches will be comfortable with the DVS 5000V. Regardless of whether the reader has previous experience with IBM System Networking, this publication is designed to help you get the DVS 5000V functional quickly, and provide a conceptual explanation of how the DVS 5000V works in tandem with VMware.